Etching by Jacques Androuet Du Cerceau?, dimensions probably about the same as those of E.60. COLLECTION: Paris, Bd 19, Vol. I (Primatice), fol. 56?, hole in the area of the right breast and badly abraded above and to the right of this hole. LITERATURE: Boorsch, 1988, 9, Fig. 7, as after Rosso. 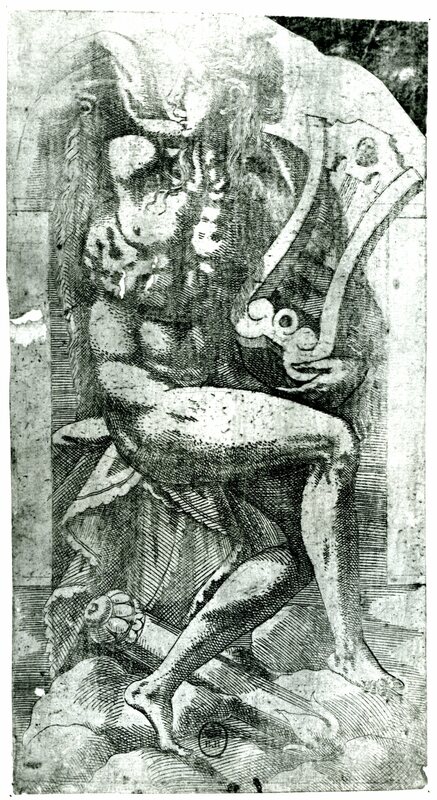 The manner of the etching of this print is clearly the same as the etching of the Apollo holding a Lyre (Fig.E.60). Furthermore, with the shapes of the settings of the figures in these two prints being the same, they can be connected to each other by their identical sources. 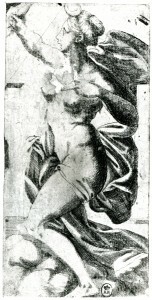 The Diana is one of a group with Rosso’s drawing of Apollo holding a Lyre (Fig.D.76Aa), the engraving derived from it (Fig.E.151), and the anonymous etching of Venus and Cupid (Fig.E.152) that can most likely be related to the decoration that Rosso planned probably in 1537 or 1538 for the Salle Haute in the Pavillon des Poêles (L.43). The breadth and extensive modelling of the form of Diana suggest that the image is contemporary with that of the companion etching and like it slightly later in conception than the Apollo holding a Lyre known from Rosso’s drawing and the engraving derived from it. Neither etching gives any indication of the half-circle shape of the top and bottom of Rosso’s drawing. Neither does the Venus and Cupid. The Diana was most probably made from a lost drawing for the Salle Haute project and not from the figure executed in the Salle Haute. The Apollo is not reversed, and one would suspect that this is also the case with the Diana. Unusual, however, seems to be the depiction of the goddess holding the bow in her right hand with the left hand having been used to hold the arrow, which has already been shot and is not visible in the print. 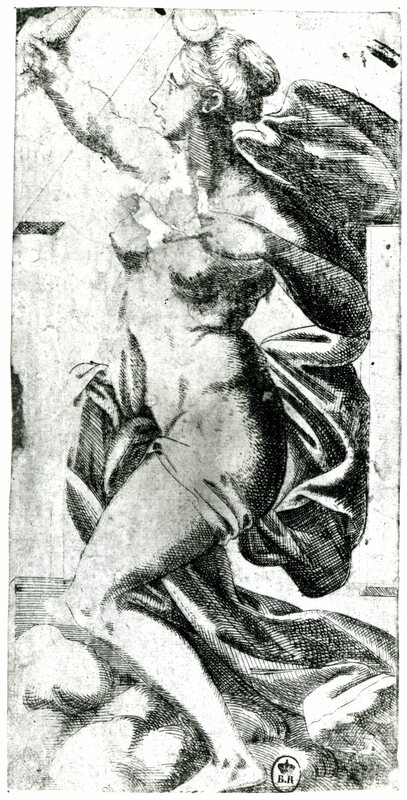 The Venus and Cupid print, by another etcher, seems from the major gesture of the goddess’s right arm also not to be reversed. Thus it is possible that the Diana is also not reversed in spite of the fact that it shows a left handed goddess. 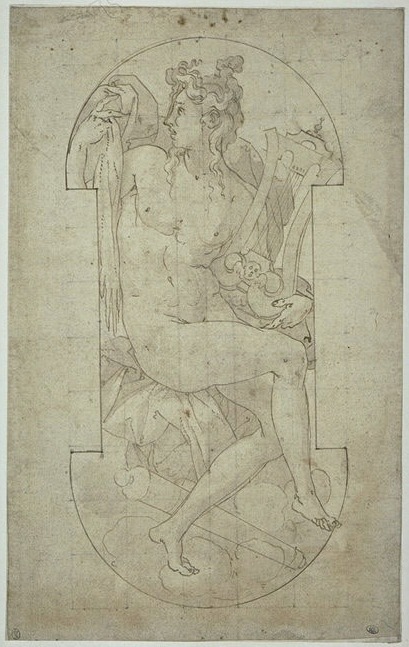 The identification of the etcher as Du Cerceau is dependent on his name being connected, perhaps wrongly, with the companion etching of Apollo. 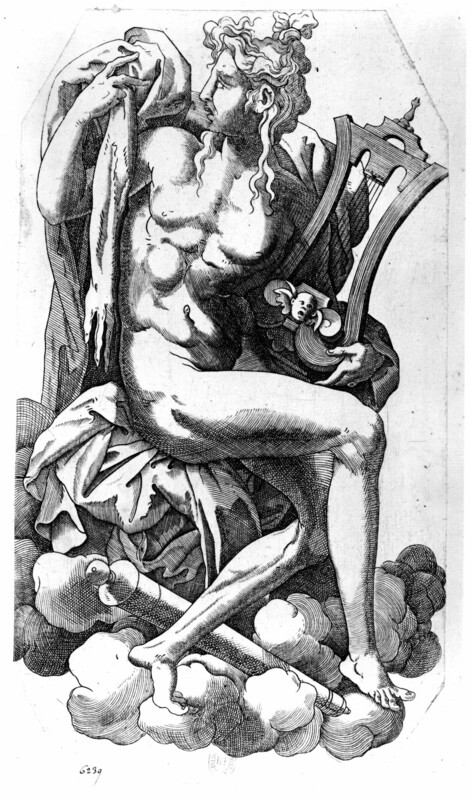 See E.151, Anonymous, APOLLO HOLDING A LYRE, engraving (with etching? ), also probably related to the decoration of the Salle Haute in the Pavillon des Poêles at Fontainebleau. See E.152, Anonymous, VENUS AND CUPID, etching, also probably related to the decoration of the Salle Haute in the Pavillon des Poêles at Fontainebleau.